So my soul longeth after thee.” This line is taken from Psalm 42 and is a beautiful expression of the human longing for spiritual refreshment. Jesus used the same imagery of thirsting after God several times. Feeling thirsty is something we can all relate to. In Psalm 42, King David compares his longing for God to a deer that is longing for a drink of cool water. This is not simply a desire for a drink. It is a deep thirst such as that experienced after a lot of activity in a hot environment. Deer have very few sweat glands and pant similar to dogs in order to cool down. The deer (‘ayyal’ in Hebrew) King David is referring to is the roe deer (Capreolus caprea) which is native to Palestine where King David lived.1 The roe deer is very similar to the white-tailed deer of North America. Roe deer are reliant on access to a water source. 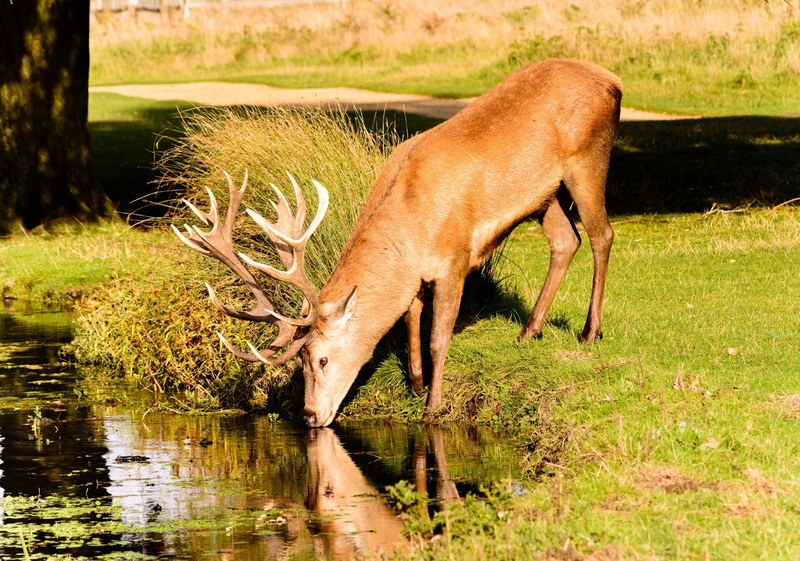 In fact, water sources are usually found in the center of a deer’s territory. They can only roam so far from a water source, and must return to it on a regular basis. Like the deer it is necessary for us to stay close to the Source of spiritual water. It should be at the center of our life. We must drink from that source on a daily basis, multiple times a day. When we don’t we become very thirsty and often become stressed. We may try to get all of our spiritual water at once, perhaps in church. But, like the deer, we cannot take that much in at once. We must drink from the spiritual source frequently, multiple times a day, to satisfy the longing for God that is in our hearts! Can you share an experience of when you were really thirsty? What does it feel like to be spiritually thirsty? What does it mean to drink spiritual water? Should we drink only when we feel thirsty? 1. Orr, James, M.A., D.D. General Editor. "Entry for 'DEER'". "International Standard Bible Encyclopedia". 1915. Accessed 10/12/17 from http://www.biblestudytools.com/encyclopedias/isbe/deer.html. 2. Arian D. Wallach, Moshe Inbar, Michael Scantlebury, John R. Speakman, Uri Shanas. Water requirements as a bottleneck in the reintroduction of European roe deer to the southern edge of its range. (2007). Canadian Journal of Zoology, 85:1182-1192. https://doi.org/10.1139/Z07-098.